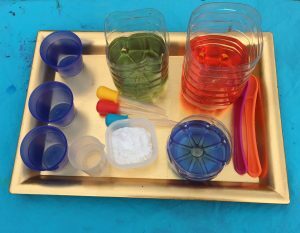 We made our very own chemistry set for experimenting, mixing and playing! 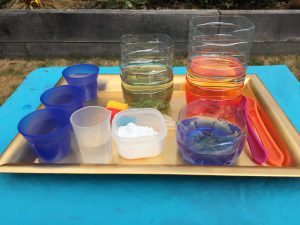 I used some old squash bottles that I cut off at different heights and filled with water and food colouring, a little measuring jug containing some vinegar, some food savers, some bicarbonate of soda, a couple of plastic spoons and some pipettes. I set this up outside in case of an explosive reaction! 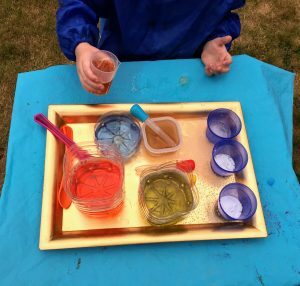 And the instructions to my preschooler – just experiment, explore and create! He had so much fun with this. 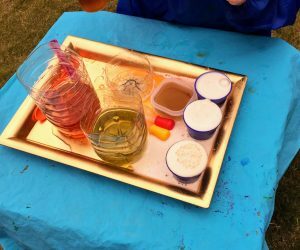 We added vinegar to the coloured bottles, and some more bicarbonate of soda to the food containers. He loved seeing the ‘eruptions’! 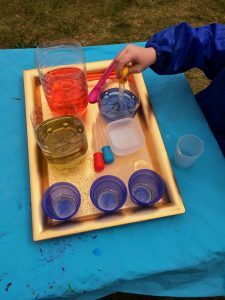 He enjoyed colour mixing, pouring, pipetting and investigating. And I think he loved that there were no rules, he could just explore however he wanted. 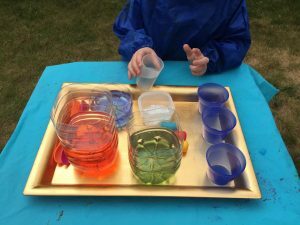 This was very simple to set up, and a great activity to do outside! Though with the tray, it would be fine indoors too. 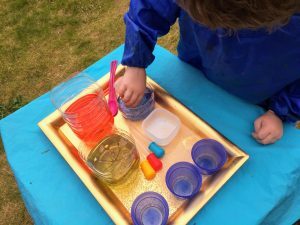 Previous story Painting with ice cubes!